Heads In Clouds. Feet On Earth. Although we feel the most comfortable showcasing our wonderful staff, we understand that some people might be curious about who is behind the magic curtain. We are a husband and wife team – high-tech designers by day in San Francisco, CA – shape shifting over time and space as dreamers and doers to shepherd Casa Xixim into reality. Building from the ground up was a labor of love and a test of will. We agreed from the start to design a site specific, eco-friendly villa optimized for vacationing groups. We brought our architect, Specht Architects, to visit our lot and experience Soliman Bay first hand. We plotted out the sun’s path and extended overhangs to provide deep enough shade, we planned a cross breeze for every room, we built around the largest palms, transplanted when possible, and added green roofs as insulation and habitat. We are grateful for what had started out in 2004 as mere sketches in the sand has now blossomed into an amazing eco-conscious-beachfront-boutique-hotel-style-villa of our dreams. We are honored to be the current stewards of this special place, and we hope to attract like minded vacationers to rest their heads and energize their souls at Casa Xixim. With Casa Xixim nestled between the ocean and jungle, it is impossible to avoid the realities of our changing climate. It’s our mission to help keep this fragile ecosystems beautiful and thriving. We believe that travel helps expand one’s mind, get to know another culture, and better understand our collective impact. When you stay at Casa Xixim we hope you feel – first hand – that living gentler and kinder on this earth is entirely doable. We are grateful to participate in the Soliman Bay Sea Turtle Project – following strict procedures, marking nests, and reporting our successful hatches. These turtles lives take place at sea but they always return to land to nest. Turtle mamas swim to our beach at night, dig a nest with their flippers, lay their eggs (85 – 120 per nest), bury them with sand, and return to the sea. Offspring take between 50 – 60 days to hatch and the most difficult task is for the babies to reach the sea. We also make a point to give back to what inspires us: children’s education with Escalera.org, conservation with WildAid, and more. For those seeking to be a thoughtful traveler, Casa Xixim is a vacation where one can get away and get totally zenned-out without trampling over everything in the process. Our guiding beliefs, the Xixim Ethos, began as a feeling inspired by the raw beauty of this beach and has evolved into our daily practice. The ancient Maya word Xixim (pronounced “shee-sheem”) is written as a conch shell glyph meaning “zero”. We chose this conch symbol, a rare and endangered sea creature, to remind us to be true to our goal of being as sustainable as possible. We aim to capture the daily resources needed, work in harmony with nature, and to leave a light footprint – all without sacrificing modern comforts. Even the design of our logo is built with the shape of this conch symbol. The symbol is arranged to compose the wings of the locally abundant and lighthearted butterfly, representing transformation and new beginnings. The concept of environmental stewardship is a keystone to our design process and daily work. We combine traditional building practices with modern architecture and permaculture principles. We utilize stacking functions with our terraces: solar, shade, water collection and pollinator habitat. The sun, breeze and rain provide our home its life force. We buy local, reuse, compost, resist plastic and DIY. Our rooftop solar array supplements our household power needs and doubles as our hammock shade structure. We're proud to say that Casa Xixim is the first grid-tied net metered home on Soliman. To reduce AC dependency (and the resulting costly environmental impact), we have sliding walls for cross breeze and Haiku ceiling fans in every room – the most energy efficient ceiling fan in the world. Our terraces are designed to collect rainwater into our subterranean cistern storage to supplement our household water needs. 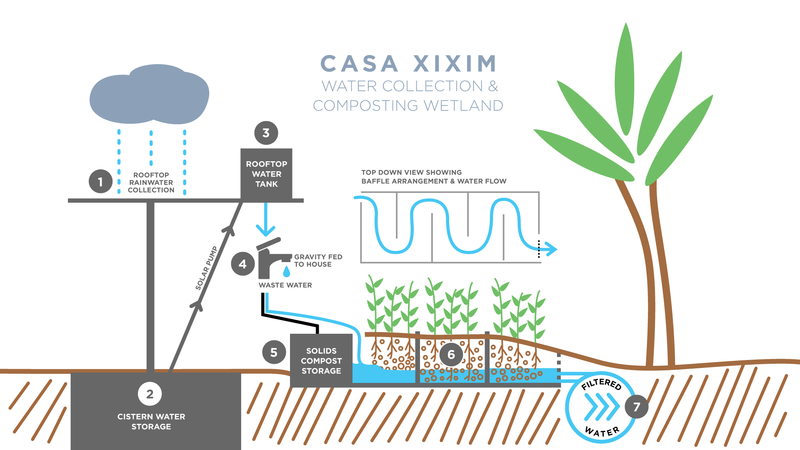 Composting garden wetlands – instead of a septic tank – allows water from sinks, showers and toilets to be composted, filtered and safely returned back to the earth. Large water-cooler style jugs are provided for cooking and drinking.